One of the big draws of this show is its varied character designs, and up till now it’s mainly been letting each personality tell its own story. This week, it kicked things up a notch and really gave us a lot more of the characters spending time with each other. The scene showcasing the rising tension was as solid as the early episodes were, but the comedy was vintage Kishi Seiji. * Between numerous scenes proving that Shoukiin Kagerou would have a field day with every one of them and the sauna scene proving that Ishimaru and Oowada were bad enough to be right at home being captains in Kaiser Reinhard’s fleet, pretty much every joke was a dead-on critical critical. What’s even better is that including all that didn’t disrupt the series’ appreciably fast pacing. 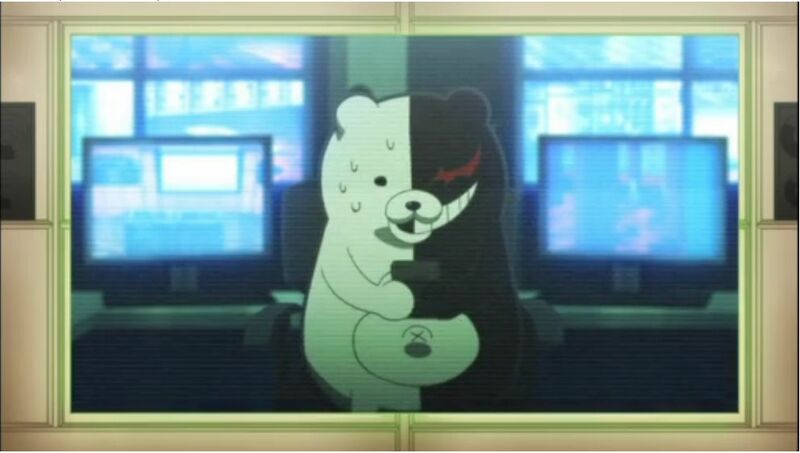 Monokuma (or whoever’s behind him, as the case may be) has both a fantastic sense of timing and a real knack for playing god. I laughed really hard when he cut in on the conversation the kids were having about their situation with sarcastic applause only after Naegi’s inspirational line, but that was an damn good bit of mood manipulation. Between that and the threat to spill everyone’s beans, he’s definitely maximizing his odds of breaking the cast. Can’t hurt that he’s patching the rules as he goes along, as he did in prohibiting notebook exchanges. Speaking of which, this episode dropped a number of key rules now relevant to the game, from the boys/girls exclusive changing room setup to the aforementioned patch. Can’t imagine how that’s every bit is going to play in, although the patch makes sense because there’ll probably be at least a few situations in the future where it’ll rule out an easy wrong answer. My best guess for the murder so far is that it was one of the athletic types, either Oowada or Sakura. That’s based mostly on the fact that it would be damn hard to swing around a dumbbell with that many weights added on without some real muscle. It seemed very suspicious that Togami knew to try the lock, so add him to the list. The fact that the boys/girls changing room posters were swapped makes it more likely it was a guy, something confirmed by Kyoko’s discovery of the active notebooks. So my tentative suspects are those Togami and Oowada. Togami’s a bit more likely just because of how much he led Naegi on this episode, but I can’t be sure if he could lift that weight. We’ll see how the upcoming trial goes. *Though it was less Sunred and more Seto no Hanayome. I loved both shows, but he’s really got nothing to lose in being as over-the-top camp as possible here. This entry was posted in Anime, Currently Following and tagged Anime, Astro Fighter Sunred, Black Comedy, Campy Direction, Dangan Ronpa, Dynamic Cast, First Reactions, Kishi Seiji, Legend of the Galactic Heroes, S! and M!, Seto no Hanayome, Summer 2013, Summer 2013 Anime by torisunanohokori. Bookmark the permalink.